Can we all agree with the fact the Porsche 911 is the most frustrating car to shop for? It almost always feels like when you purchase the current best-of-the-best variant, a new best-of-the-best variant shows up within a few months to replace it. The cycle never ends, which can either be a good or a bad thing; it just depends on how you look at the 911 model lineup. With that being said, it's time to move on. Over the past few decades, Porsche has been constantly tuning and refining the 911 from a very twitchy sports car with a light front end to a fairly luxurious grand tourer, which one can drive with confidence year round. Over the last year or so, Porsche has launched the updated 911 GT3, then the GT2 RS, and now at the 2018 Geneva Motor Show, the 2019 911 GT3 RS. 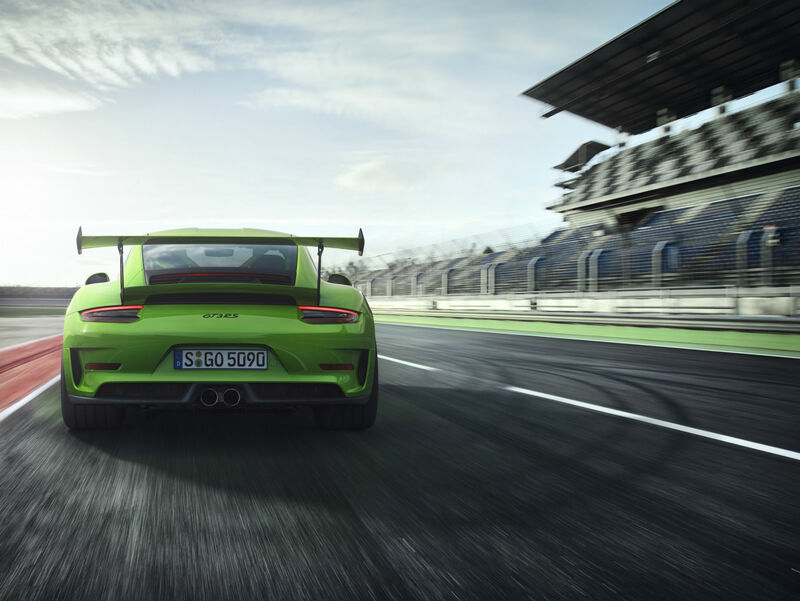 Porsche claims that the new 911 GT3 RS is the most powerful naturally aspirated nine-elfer it has ever produced. The 4.0-liter flat-six motor in the 911 GT3 RS produces a healthy 520 horsepower and 346 pound-feet of torque at 9,000 RPM. Compared to the standard 911 GT3, the revised engine produces an additional 20 horsepower and 7 pound-feet of twist. Like the 911 GT3, the 911 GT3 RS's engine also benefits from the same plasma-coated cylinder liners, larger-diameter bearings for the crankshaft, larger connecting rod bearings, and rigid valvetrain shims. While the standard 911 GT3 can be equipped with either a six-speed manual or a seven-speed PDK gearbox, the 911 GT3 RS will come standard with a seven-speed dual-clutch transmission, which has been recalibrated to handle the additional power output from the engine. With the retuned powerplant, Porsche engineers estimate that the GT3 RS will sprint to 62 miles per hour from a standstill in just 3.2 seconds and its top speed is limited at "just" 193 miles per hour. As expected, the aero and weight reduction components found on the GT3 are also found on the GT3 RS, but the RS also receives a carbon-fiber frunk lid and rear fenders along with it a magnesium roof. The 2019 Porsche 911 GT3 RS also borrows certain components from its big brother, the 911 GT2 RS, like the NACA ducts in the frunk lid which helps with brake cooling and a larger front spoiler which, along with the rear fixed wing and diffuser, helps in producing twice as much downforce as the regular 911 GT3 at 124 mph. The chassis of the 911 GT3 RS also receives upgrades like new helper springs on both axles, improved ball joints, and a further refined rear-wheel steering system. Up front, the GT3 RS rolls on 20x9.5-inch forged alloy wheels which are wrapped with 265/35 series ultra-high performance tires while out back, the car rides on 21x12.5-inch forged alloy wheels and are wrapped with 325/30 series rubber. Since this is a model from Porsche, the company also offers two additional packages which further reduces the overall weight of the 911 GT3 RS. The $18,000 Weissach package includes carbon-fiber front and rear anti-roll bars and coupling rods, a carbon-fiber roof, and carbon-fiber steering wheel trim and paddle shifters, which results in total weight savings of 13 pounds. For additional weight savings of 25 pounds, you can also opt for the $13,000 magnesium wheels. The 2019 Porsche 911 GT3 RS will gon on sale in the U.S. this fall and will have a starting price of $188,550 which also covers the destination charges. Meet the 993-Generation 911 GT3 RS Porsche never made. It's the most powerful naturally aspirated 911 of them all ... and it revs to 9,000 RPM.